You might remember All Access: Sacramento, which was the first ever Abortion Access Hackathon! 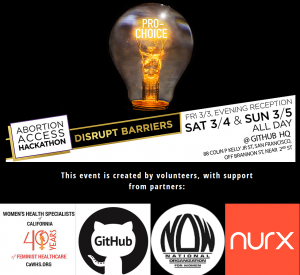 Women’s Health Specialists is partnering with a group of tech experts who double as independent abortion rights activists in San Francisco for another Abortion Access Hackathon–this time a 3 day event, March 3 – 5th, with over 300 participants! The event is already booked, but check out this article in Teen Vogue about the hackathon and look out for its mention in other upcoming national publications!